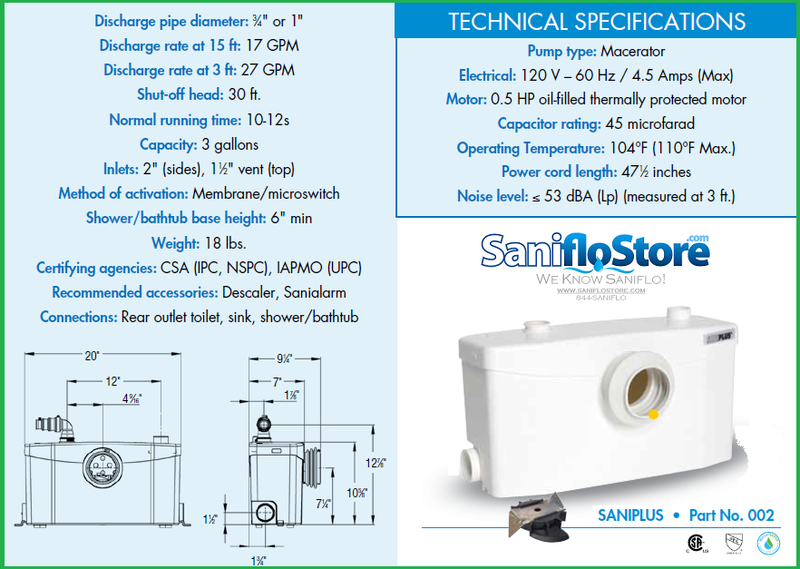 The Saniflo Saniplus is a macerator pump used to install a complete bathroom up to 15 feet below the sewer line, or even up to 150 feet away from a soil stack. The Saniplus macerator pump can handle the effluent from a toilet, sink, bathtub and shower. The Saniflo Saniplus discharges the waste through a 3⁄4" or 1" rigid pipe. A non-return valve is included on the discharge elbow assembly provided with the system. This elbow can be rotated 360 degrees depending on the discharge installation. Has been designed with a 1 1⁄2" vent connection on the top of the lid. All plumbing codes require connection to a vent system. Please note that the vent system should be a two-way air vent as air needs to freely flow both ways. Note: The use of mechanical vents, air admittance valves or similar devices is not permitted. Will also discharge gray water from any sink, bath/shower or urinal. The wastewater will drain into the system via two 2" inlets with built-in check valves on either side of the housing. Note that when adding a bathtub/shower, the base should be raised up by a minimum of 6" off the floor.